Note: Due to the unavailability of the fast affiliates last week, “Last Week” numbers in this week’s report are based on the final national numbers. Additionally, some HH rating/share data for this evening was not available either. CBS finished in first place for the evening with a 6.5/11 household rating/share, 10.39 million viewers and a 2.4/7 rating/share among adults 18-49. 8:00 p.m.: Ghost Whisperer (7.1/13 HH rating/share, 11.39M viewers, 2.8/9 A18-49 rating/share). 9:00 p.m.: Flashpoint-REPEAT (6.0/10 HH rating/share, 9.60M viewers, 2.2/6 A18-49 rating/share). 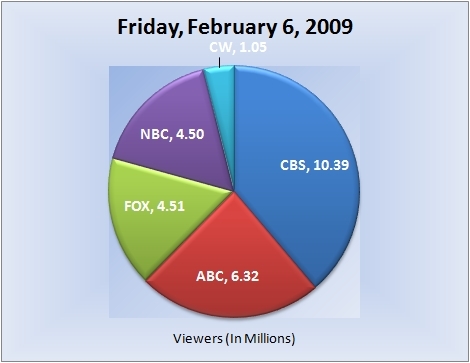 10:00 p.m.: Numb3rs (6.5/11 HH rating/share, 10.18M viewers, 2.2/7 A18-49 rating/share). ABC followed in second place for the evening with a 4.2/7 household rating/share, 6.32 million viewers and a 2.1/6 rating/share among adults 18-49. 8:00 p.m.: Wife Swap (3.3/6 HH rating/share, 5.06M viewers, 1.8/6 A18-49 rating/share). 9:00 p.m.: Supernanny (4.4/7 HH rating/share, 6.52M viewers, 2.3/7 A18-49 rating/share). 10:00 p.m.: 20/20 (5.0/9 HH rating/share, 7.39M viewers, 2.1/6 A18-49 rating/share). FOX finished in a tie for third place for the evening with a 2.8/5 household rating/share, was alone in third among viewers with 4.51 million and was tied for third among adults 18-49 with a 1.4/4 rating/share. 8:00 p.m.: Cops (4.13M viewers, 1.3/4 A18-49 rating/share). 8:30 p.m.: Cops-REPEAT (4.67M viewers, 1.5/5 A18-49 rating/share). 9:00 p.m.: America’s Most Wanted (4.62M viewers, 1.5/4 A18-49 rating/share). NBC followed in a tie for third place for the evening with a 2.8/5 household rating/share, was fourth among viewers with 4.50 million and was tied for third among adults 18-49 with a 1.4/4 rating/share. 8:00 p.m.: Howie Do It (4.69M viewers, 1.3/4 A18-49 rating/share). 8:30 (8:29) p.m.: Howie Do It-REPEAT (4.02M viewers, 1.2/4 A18-49 rating/share). 9:00 p.m.: Friday Night Lights (2.5/4 HH rating/share, 4.21M viewers, 1.4/4 A18-49 rating/share). 10:00 (10:01) p.m.: Dateline (3.2/6 HH rating/share, 4.93M viewers, 1.4/4 A18-49 rating/share). The CW finished in fifth place for the evening with a 0.7/1 household rating/share, 1.05 million viewers and a 0.4/1 rating/share among adults 18-49. 8:00 p.m.: Everybody Hates Chris (1.36M viewers, 0.5/2 A18-49 rating). 8:30 p.m.: The Game-REPEAT (1.18M viewers, 0.5/1 A18-49 rating). 9:00 p.m.: 13—Fear is Real (0.5/1 HH rating/share, 0.84M viewers, 0.4/1 A18-49 rating). Note: Network average numbers from the week prior are based on fast affiliate data. Comparison’s from the week prior (or episode-to-episode, etc.) on specific shows are based on final national data. Ratings for the current day are based on fast affiliates. (Expect all three scenarios to be the case at all times, unless otherwise noted). The final rating for first-run episodes that aired this evening will be reported the following week. So for example, the final rating for tonight’s episode of “Ghost Whisperer” will be reported in next weeks report for Friday, February 13, 2009.